Robin Smith, National Centre for Atmospheric Science (NCAS) and UKESM core group. There is currently an intense focus in the UKESM development group on finalising the 1st version of UKESM that will be used for the majority of CMIP6 runs that start early next year. But there will be more than one configuration of UKESM, each with different strengths, designed to explore different science questions. One of these alternative configurations will have fully interactive, dynamic ice sheets – a new frontier in climate modelling, and one that will give UKESM unique capabilities amongst Earth system models. An overview of this version, UKESM1-IS, was presented in our previous Newsletter no.2 April 2016 (An overview of the Land Ice in UKESM1). Since then a great deal of progress on coupling the ice sheets to UKESM has been made through a fruitful cross-centre collaboration between the Met Office, British Antarctic Survey and Reading and Bristol Universities, led by the UKESM core team. Ice sheets have significant interactions with many other parts of the Earth System, so as well as developing mechanisms for passing information to and from the ice sheet model we have also had to make major scientific and technical developments in other parts of UKESM, introducing new subgrid scale surface and snow physics into JULES and enabling NEMO to simulate the ocean under floating Antarctic ice shelves. We now have a working prototype of UKESM-IS with a fully interactive, dynamic Greenland ice sheet that is being used to tune and evaluate the coupled system. To reduce the computational overhead and enable long simulations, UKESM1-IS will run without interactive atmospheric chemistry and ocean biogeochemistry found in UKESM1 – this prototype suite setup uses about the same resources as a normal HadGEM3 GC3.1 simulation. Greenland is not the only ice sheet on Earth, of course, and some of the most interesting questions – and potentially the ones with most impact on sea-level – are centred around Antarctica. Around half of the mass loss from Antarctica occurs under the floating ice shelves that extend from the continent, so including -ice shelf interaction between NEMO and the ice sheet model is essential for simulating a dynamic Antarctica in UKESM1-IS. Not only does this require significantly higher ocean model resolution than used in the standard UKESM1, in order to represent the ice shelf regions in the first place, there is also a requirement to allow the boundaries of the ocean to change during the model simulation as the ice shelves change in physical extent. This latter point is both technically and numerically very challenging. While the scheme we have developed to address this performs well in idealised test cases, it has so far proven less robust in a more realistic domain and this part of the coupling is still being developed. Figure 1. 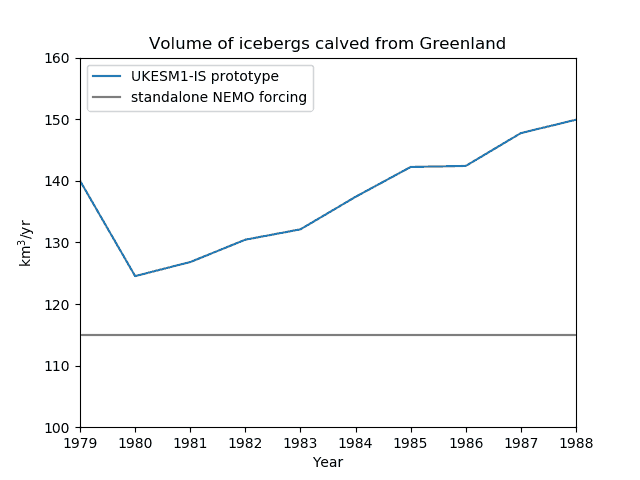 In UKESM1-IS, ice that BISICLES has calved from the edge of the ice sheets is used to seed NEMO’s Lagrangian iceberg scheme, affecting both the magnitude and distribution of iceberg melt in the ocean. The Greenland-only UKESM1-IS is still being tuned, but the volume of ice being calved from Greenland is in the right ballpark – higher than what is used in standalone NEMO runs at this resolution, but lower than observational estimates. UKESM1-IS will be used to produce results for the coupled climate-ice sheet runs specified by ISMIP6 as part of CMIP6, which focus on the climate feedbacks from a dynamic Greenland. In order that we can finish these for the IPCC AR6 deadline, we will release a version of UKESM1-IS and start these runs in the summer of 2018, pending a decision on the science-readiness of the Antarctic coupling.